Shown above is a carved Redwood room number plaque for an Inn. This rustic room number plaque features engraved numbers, dark stained Redwood, and a Braille strip. This plaque and similar ones can be made of painted High-Density-Urethane (HDU) or stained and painted wood of various species (e.g., Redwood, Oak, Maple, Mahogany, Cherry) . This plaque is hand-painted and is clear-coated twice. . 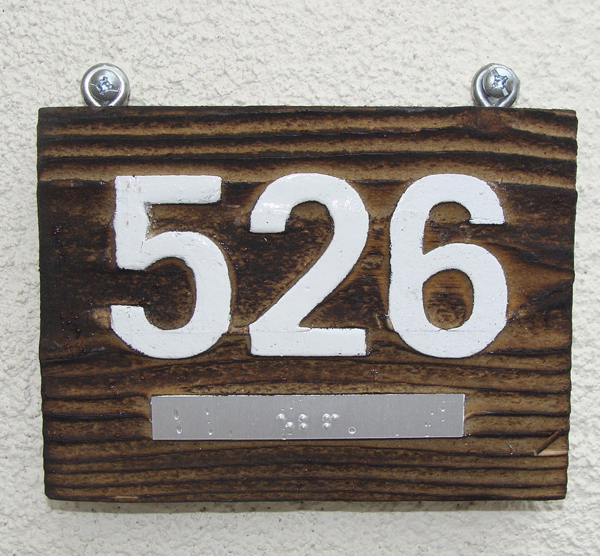 This room number plaque can be easily mounted on an outside wall ,a door, or an inside hall wall next to the room door. This section shows some of our unit or room number plaques and signs for hotels, motels, inns, and B&Bs. We can make anywhere from 1 to 1000 of room number plaques, and can match existing designs exactly.To see over 40 examples of unit or room number plaques and signs for hotels, motels, inns, and B&Bs. please click on "Return to List" below right.